question_answer1) Find the next figures in the figure pattern given below. question_answer2) If Sonu's summer holidays started from 2nd Friday of June 20XX, then on which date did Sonu's summer holidays start? question_answer3) 6th ice-cream is before ice-cream _________. 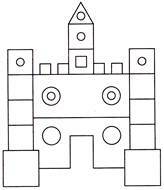 question_answer4) Shape missing in the given figure is _________. question_answer5) Select the figure that is same as the given Figure (X). question_answer6) Priya needs ______ 5 rupees and ______ 1 rupee coin to buy the chocolate. question_answer7) Which figure will complete the given figure? question_answer8) Which number comes next in the given number pattern? question_answer9) Which shape can be put together with shape R to make a rectangle? question_answer10) Which of the following gifts is the first gift? 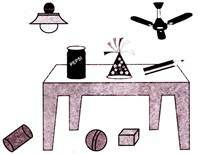 question_answer11) Identify the object which is under the table and can slide also. question_answer12) Complete the number pattern. question_answer13) How many total number of squares and circles are there in the given figure? question_answer14) There are _________ groups of 3 strawberries. question_answer15) Which ball is the lightest? question_answer16) Find the odd one out. question_answer17) How many balls are outside the basket? question_answer18) If is to then is to _________. question_answer19) Which letter is fourth from the left end in the given word? question_answer20) If yesterday was Monday, then tomorrow will be ______. question_answer21) _______ is the thickest brick and ____ is the thinnest brick. question_answer22) Select the odd one out. question_answer23) There are ____ birds sitting on the branch. question_answer24) To which group does the shape belong? question_answer25) If is related to then is related to ________.